This is modified from an Alton Brown recipe. I think there's also a video on the Food Network website in which Alton prepares it with his son. This recipe seems to have an unusually large amount of mustard powder, but it still wasn't quite flavorful enough so I added a pinch of cayenne. He also used panko bread crumbs, which I didn't have, so I used a handful of ciabatta croutons that I'd made the day before and made up the rest with sourdough bread crumbs. It was visually appealing and quite tasty. Melt the butter in a small pot (large enough to make the cheese sauce) on the stove. When the bubbling stops, whisk in flour and cook for five minutes. Stir in the milk, onion, bay leaf, mustard, cayenne and paprika. Simmer for about ten minutes or until slightly thickened. Remove the bay leaf. Add the egg (temper it first to prevent scrambled eggs). Stir in 3/4 of the cheese and season with salt and pepper. Combine cheese sauce and pasta in casserole dish (I used a 9 x 13" pan). Top with remaining cheese. For topping, mix melted 3 TBS of butter with bread crumbs. 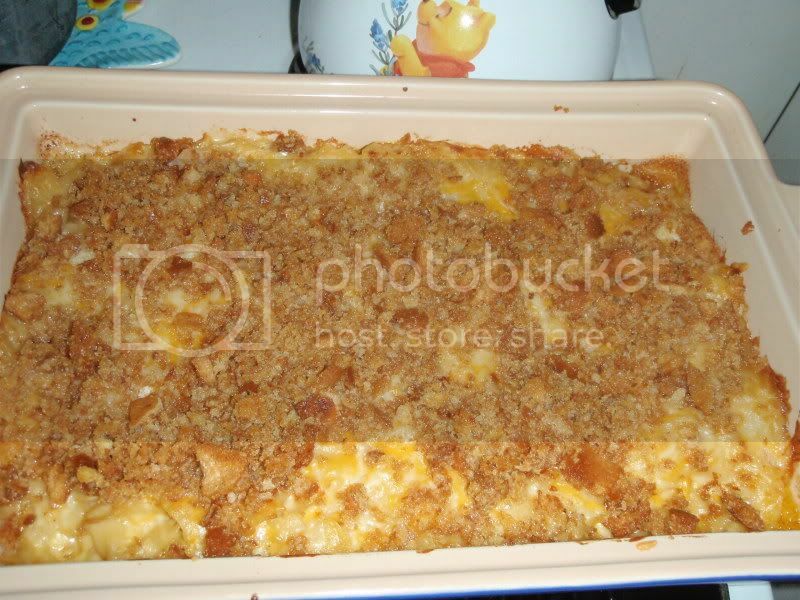 Spread evenly over the macaroni and cheese.